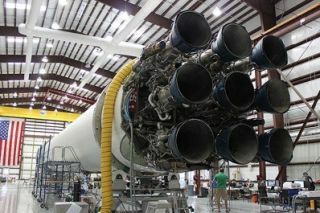 The second Falcon 9 rocket's first stage inside the hangar at pad 40. WASHINGTON? The private spaceflight company SpaceExploration Technologies (SpaceX) has shifted a planned Oct. 23 launchof itsFalcon 9 rocket and Dragon cargo vessel to November. "Ourtargeted launchdate is moving ? we've submitted a request for November 8thor 9th and arewaiting for the range to complete their standard deconfliction work andprovidea formal approval," SpaceX spokeswoman Kirstin Brost said in a Sept. 21e-mail. Theflight, a demonstration test of the medium-classrocket and Dragonspace capsule being developedunder NASA's CommercialOrbital Transportation Services (COTS) program, was originally slatedto occurin September 2008, according to the Hawthorne, Calif.-based company's2006 NASASpace Act Agreement. Minortweaks to Falcon9 hardware have been under way since the company completed aninternalanalysis of the vehicle's maiden launch from Cape Canaveral Air ForceStation,Fla. That mission was funded by a U.S. government agency that SpaceXhasdeclined to name and carried a qualification unit of the company'sDragon spacestation cargo capsule into orbit. Thefirst COTS demo entails a four-hour flight meant toshow Dragon can complete as many as four orbits, transmit telemetry,receivecommands, maneuver, re-enter the atmosphere and make a safe waterlanding andrecovery. NASAspokesman Joshua Byerly said delays with new rocketsand spacecraft are to be expected. "Theupcoming test flight is much more complicatedsince it involves not only the Falcon 9 rocket, but also the Dragonspacecraft,"he said last month. "So you are talking about two brand-new spacecraft." This article was provided bySpaceNews, dedicated tocovering all aspects of the space industry.